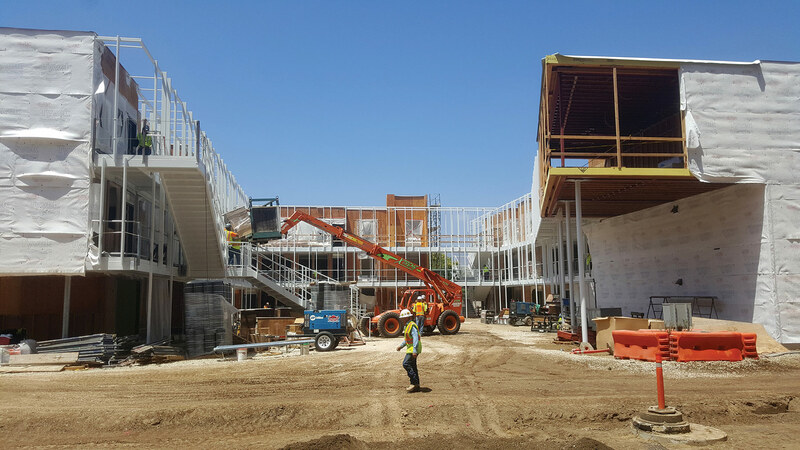 Construction on Los Angeles–based Lorcan O’Herlihy Architects’ (LOHA) 95,000-square-foot San Joaquin Housing projects at University of California, Santa Barbara (UCSB) is nearing completion. The firm is designing two of four housing clusters on the 15-acre North Campus, one of the areas where the 20,000-student university is concentrating construction efforts as it aims to increase its student population by up to 5,000 new students over the next nine years. The San Joaquin Housing area is to contain housing for 1,000 of those new residents. 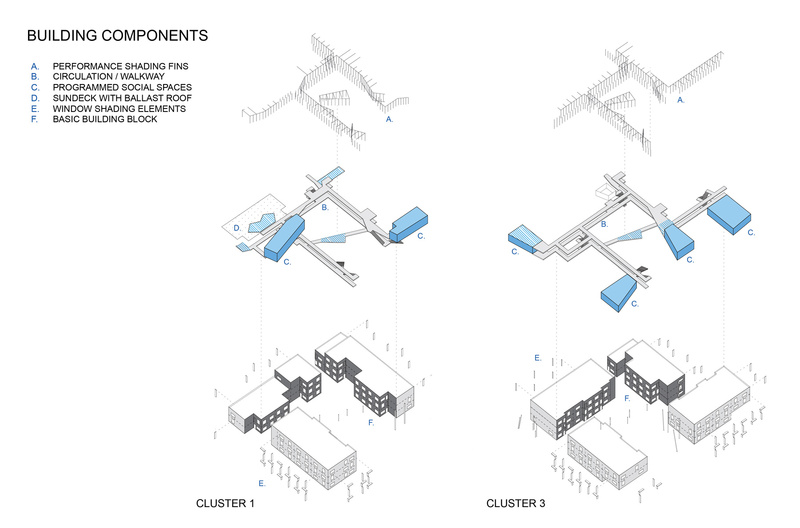 LOHA’s schemes are manifested as a pair of two- to three-story clustered apartment blocks joined by external circulation and communal spaces. The structures themselves are organized in shifting geometries, with rhomboid volumes projecting over, into, and from an activated courtyard. 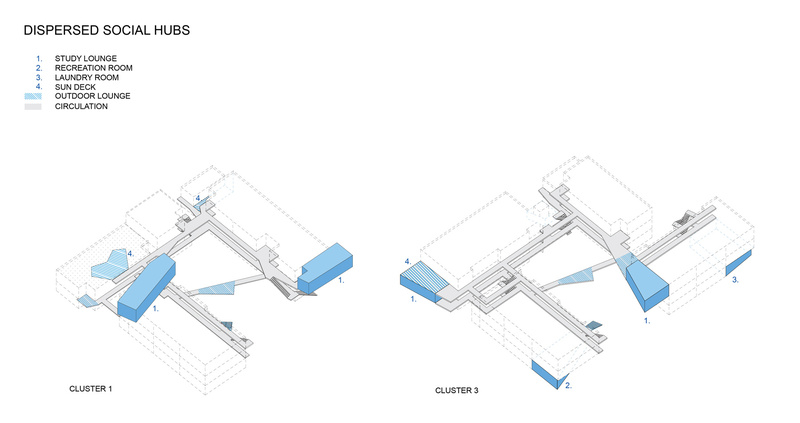 Walkways are made up of articulated armatures that attach to the buildings’ facades and project into the courtyard. The courtyard’s exterior-facing walls feature punched openings and are marked by white siding, while dark surfaces line the courtyard’s interior. 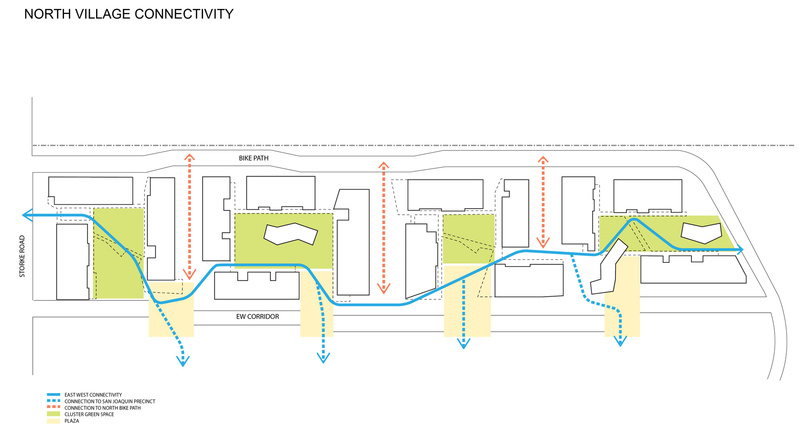 Though the overall project aims for a certain kind of scalar contextuality, this organizational scheme is decidedly daring: Social hubs, such as reading rooms, dining areas, and other gathering spots are distributed along these pedestrian routes, with some of these volumes elevated one or two stories above grade. 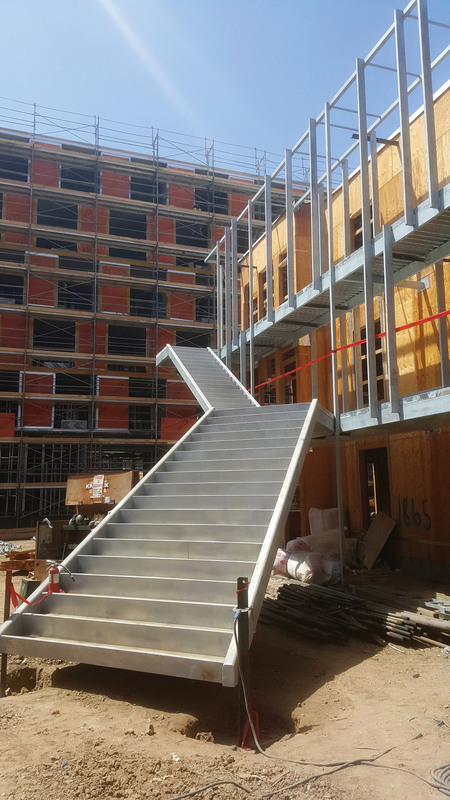 Construction photographs show a staccato filigree of painted steel supports framing out the walkways between plywood- and Tyvek-wrapped buildings. 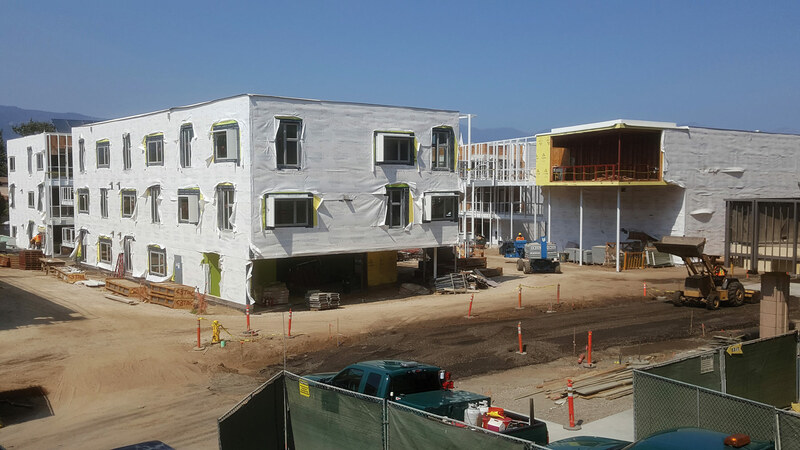 The San Joaquin Housing complex, abutting the northern edge of the adjacent, unincorporated community of Isla Vista west of UCSB, is being developed as part of a multi-architect housing expansion for the university master planned by Skidmore, Owings and Merrill (SOM). LOHA’s two adjacent complexes will be joined by two low-rise apartment blocks from L.A.’s Kevin Daly Architects (KDA) and two housing towers by SOM. Philadelphia-based architects Kieran Timberlake will also be designing a dining facility in the complex. New construction is the result of the campus’s 2010 “Long Range Development Plan” (LRDP), set in motion to plan for the campus’s growth in its ecologically sensitive, largely suburban coastal community. The university’s growth rate dictated in that document, one percent per annum, is designed to mirror that of the neighboring city of Santa Barbara. Perhaps California’s state and local agencies should take note of this latest housing construction: It seems someone has finally figured out how to build housing to meet the community’s needs in a timely fashion without offending the neighbors too much.